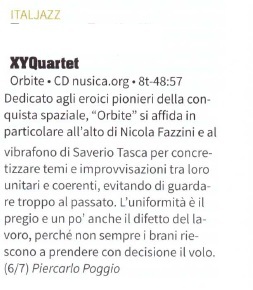 XYQuartet’s third album Orbite is coming out on 12th April 2017 by nusica.org. This release date is no coincidence: as a matter of fact, on 12th April 1961, Yuri Gagarin was the first man to journey into outer space and complete an orbit of the Earth. To celebrate the event U.N.E.S.C.O. established the International Day of Human Space Flight, on this day, in 2011. In the previous XY album the theme of space and its exploration was included just in some tracks, while in this new album, being a proper concept album, it’s developed throughout the eight original compositions dedicated to those men and women who were the first to explore Space with their epic, dramatic and sometimes even tragic or controversial stories. Fazzini and Fedrigo, bandleaders and founders of the group, were born in the 70’s and they have lived the wonder of those pioneers’ space flights. They have thus transferred in their music all those distant memories which have taken on an aura of a proper postmodern myth. Musically speaking it’s a big step towards the evolution of this band’s musical language which goes from jazz to contemporary music, from prog to post minimalism and from pop to the latest NY influences. To do so, they research and develop this new language in a creative and fluent way, putting together all these different musical codes in a very homogenous form. 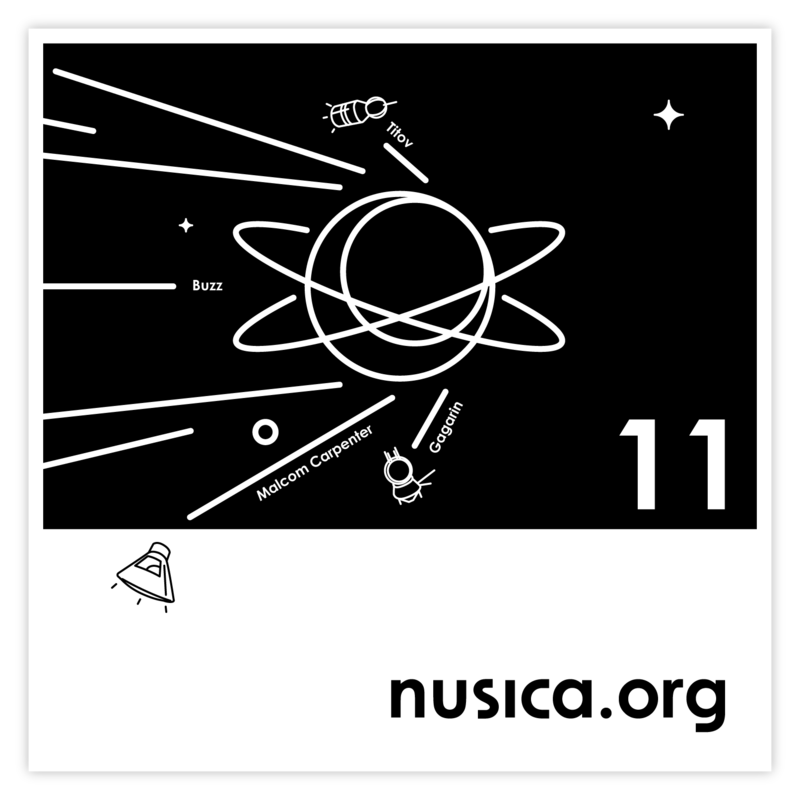 Orbite is the eleventh album produced by nusica.org. 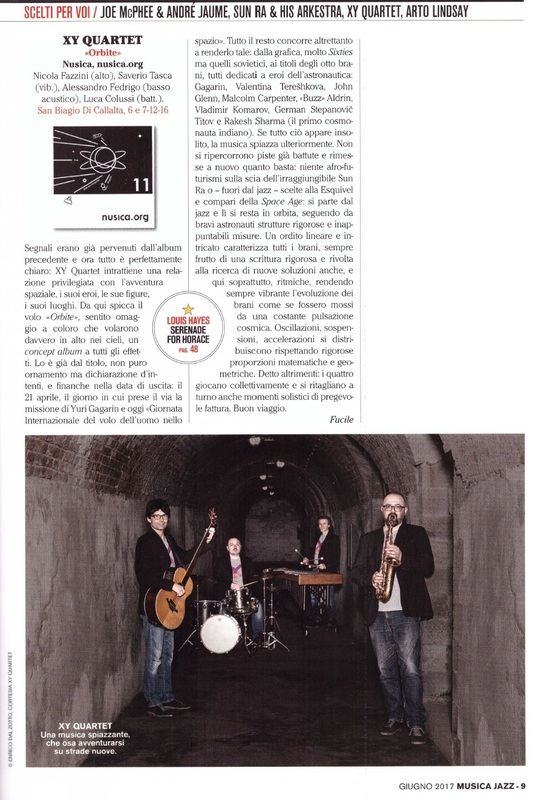 Nusica.org promotes music culture on the web, believes in the open content philosophy sharing ones music, scores and videos on the website and it promotes the music culture all over Italy through festivals, concerts and workshops. 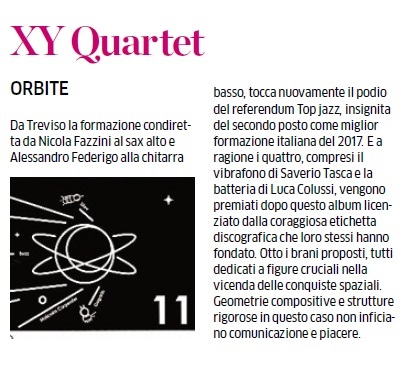 XYQuartet is a band from the North of Italy which was born six years ago and has already done lots of concerts in Italy and abroad, playing in the most famous and prestigious Italian Jazz Clubs such as Casa del Jazz in Rome, Torrione Jazz Club in Ferrara, Centro D’Arte in Padova and many others. 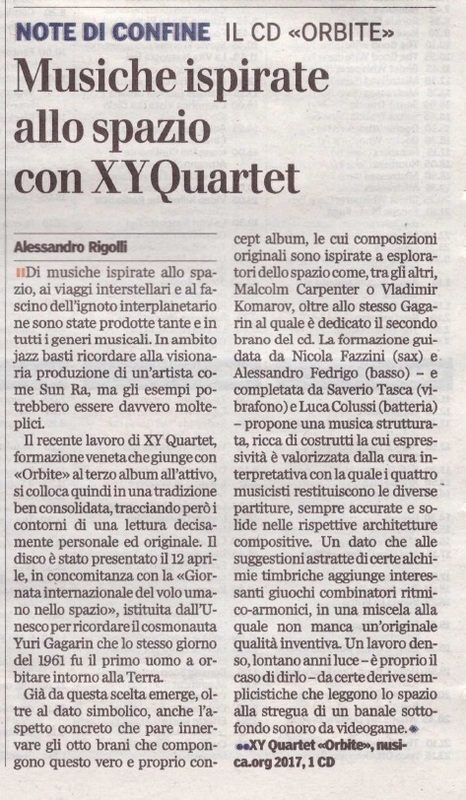 XY Quartet has published two albums and has been acknowledged by the critics and the audience. This dense, dark, and mysterious piece has serial elements and three different rhythms, built on 3, 5, and 7, are superimposed. The soviet astronaut German Stepanovic Titov would have been the youngest astronaut to orbit the earth, but Gagarin was chosen because of his proletarian background. This composition has four sections and utilizes two six-note scales built on a tritone. When recombined, these scales form a 12-tone series. The meter varies, from short to longer measures and vice versa. Gagarin was the first explorer of a new space and this composition explores a new space. There is no gravity in the first section, then slowly the material takes shape and ascends and then reaches a victorious descent in the end. This is a long composition made of three sections, to signify a sort of descent from space to the abyss, like in the astronaut’s life. He famously landed 300km away from his target destination because of an error. After being assigned to some desk duties at NASA he joined Jaques Cousteau, shifting from space explorations to maritime ones. He is a living and controversial figure. The composition is incomplete for this reason. It’s structured in three sections that describe his youth in the military in the first, the second is Aldrin’s career in space and the third his political life. The piece is based on two 6-note scales. Buzz Aldrin was the inspiration for the main character in Toy Story. She was the first woman to orbit the earth. Like the rhythm generated by the distance between two sounds, woman as “goddess of children”, whose voice gives rhythm to primal knowledge. The piece evokes a womanís voice and its enclosing force and it develops like the universe, from a small compound, expanding. The first American in space and later the oldest astronaut on a mission, John Glenn is the inspiration for this piece. A composition that combines elements from the jazz tradition (song form and harmonic approach) with more innovative elements (polyrhythms, unusual intervals). Rakesh Sharma was the first Indian cosmonaut and the first to practice yoga in space. This composition is a sort of meditation based on a series of 12 notes, built on intervals of major thirds and perfect fourths. A way to combine math and spirituality, like yoga’s deep breathing techniques. He was the first person to die in a space mission. His music unravels form mechanics and humans invention, and it ends up with the invention of mechanics, the unexpected, destruction, and error. > Raffaello Carabini on Spettakolo!